The well-known second messenger cyclic adenosine 3′-5′-monophosphate (cAMP) plays a central role in the cells response to external stimuli. While the regulation of cAMP can be controlled by a number of signaling pathways including calcium, inositol and receptor tyrosine kinases, the majority of its regulation falls downstream of G-protein-coupled receptors (GPCRs). This family of membrane proteins makes up the largest group of targets of approved drugs and represent a potential depot for emerging therapies with a large number of orphan GPCRs remaining to be characterized. The efficacy of a GPCR modulator can be quantified by measuring cAMP for Gs or Gi coupled receptors. Various tools to measure cAMP levels have been validated for high-throughput screening. These are generally homogenous readouts that cannot take into account single cell measurements or locate cAMP within sub-cellular compartments. Tools to enable these types of measurements are of particular utility to support focused screening campaigns and follow-up efforts and have the potential to shed light on a drug’s potential mechanisms of action. Hackley et al. has described a sensor, termed cAMPr, which is a genetically encoded single-wavelength fluorescent detector of cAMP. 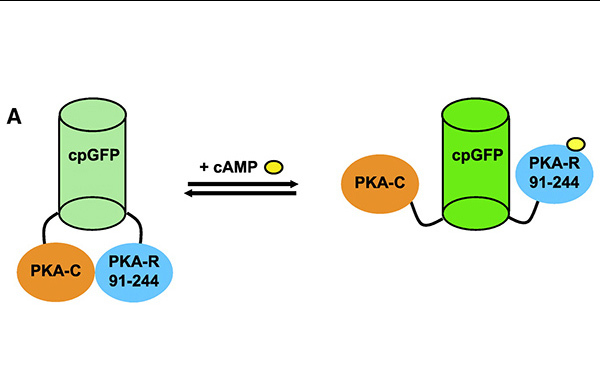 Based on the affinity of cAMP for PKA, the reporter has been engineered with a circularly permuted GFP that undergoes a conformational change to increase fluorescence when engaged (Figure). The cAMPr sensor opens up opportunities to orient cell and subcellular signaling events and serves as an alternative to established two-protein fluorescent FRET sensors which have been known to be associated with photo-bleaching, cross-talk, and multiplexing challenges. To demonstrate the utility of this cytoplasmic sensor, the authors expressed cAMPr in mouse ES cells as well as differentiated mouse neurons and show through confocal image analysis that both cell systems reliably respond to stimulation as appropriate and in ES cells can return to baseline after multiple stimulation cycles. Functionality was also shown in vitro by expressing cAMPr in Drosophila neurons and using two proton imaging, a technique capable of detecting fluorescence within whole tissue samples. Using this method, cAMP signaling in both dissected adult fly brain and in intact larval brain was quantified. Simultaneous measurement of cAMP and Ca2+ were also conducted in larval brain samples by including a compatible genetically encoded Ca2+ sensor. The authors mention the future potential of targeting later versions of cAMPr to specific subcellular compartments as well as fine tuning the sensors dynamic range to suit the level of detection needed. By showing cAMPr’s functionality in mammalian cell culture, Drosophila brains and in conjunction with a Ca2+ sensor the authors demonstrate utility in a diverse set of experimental models. Targeting sensors such as this will allow researchers to shed light on signaling events within physiological context. Genetically encoded fluorescent sensors enable cell-specific measurements of ions and small molecules in real time. Cyclic adenosine monophosphate (cAMP) is one of the most important signaling molecules in virtually all cell types and organisms. We describe cAMPr, a new single-wavelength cAMP sensor. We developed cAMPr in bacteria and embryonic stem cells and validated the sensor in mammalian neurons in vitro and in Drosophila circadian pacemaker neurons in intact brains. Comparison with other single-wavelength cAMP sensors showed that cAMPr improved the quantitative detection of cAMP abundance. In addition, cAMPr is compatible with both single-photon and two-photon imaging. This enabled us to use cAMPr together with the red fluorescent Ca2+ sensor RCaMP1h to simultaneously monitor Ca2+ and cAMP in Drosophilabrains. Thus, cAMPr is a new and versatile genetically encoded cAMP sensor. ASSAY & Drug Development Technologies, published by Mary Ann Liebert, Inc., offers a unique combination of original research and reports on the techniques and tools being used in cutting-edge drug development. The journal includes a “Literature Search and Review” column that identifies published papers of note and discusses their importance. GEN presents here one article that was analyzed in the “Literature Search and Review” column, published in Sci Signal titled “cAMPr: A single-wavelength fluorescent sensor for cyclic AMP“, authors are Hackley CR, Mazzoni EO, Blau J.